Join our, "Wall of Fame!" We will take a photo of the little one's 1st haircut and develop it and display it on our gallery in the shop. 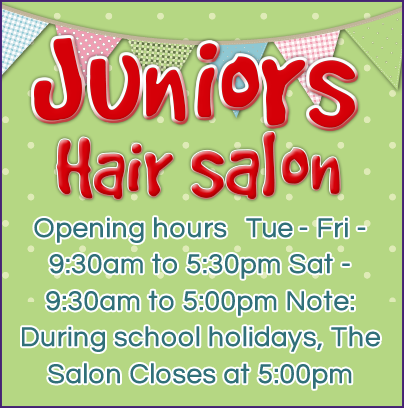 On your return visit for their 2nd haircut find it on our board and take it home as a further keepsake from Juniors! You might even win a free haircut in our regular, "Picture Draw!" For the newest recruits to the salon we offer 1st certificates complete with a lock of hair from their first cut as part of the service. We also provide an envelope with a few more first curls to distribute between doting Grandmas and to help complete their "baby album". There is no minimum age for this service. We look forward to your 1st visit - you'll look forward to your next.